Brazil is green, and it’s rainy. We did a short visit to this country and these 2 adjectives describe very well what we have seen. We were a little bit worry about the security because all of the things you heard in the medias. We avoid the big cities and just visit the south part and it was like other countries in South America, not more and not less dangerous. The border cross happens with any problems. Passport, documents for the vehicle and that’s it. It lasted 20 minutes. To avoid the city of Porto Alegre we took the coast road, and it is until now the most dangerous road we have seen. The road was completely damage, broken and full of holes. Sometimes you had to break almost completely or even change the line to avoid the imperfects on the pavement. We made it, but the rattle and vibration of cactus were really annoying. In that moment we realize that we have to fix the suspension of the van. This road is also cut in two by the see and to cross it we had to ship cactus in an old ferry where we were all together, there was passengers, cars, trucks and even a horse! Our first night we slept in Cassino, we found a park slot that was literally at the beach, really nice to wake up there. In that town we change the front battery from cactus because we realize the day before that was really hot and it starts to boil! *We ate “feijoada”, a typical dish with black beans or feijos, white rice and some meat. 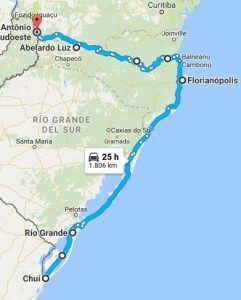 The next day we finally arrive to Florianópolis were we met Maciej, Gosia and Tomek, the family that met cactus at the port of Belgium and with who we were in virtual contact till that day. The weather was not the best during the days we spend there. One of the days we visit the beach Praia Mole, very beautiful. We had so much fun playing with the waves! Other day we had the luck to find some “orquesta” playing the drums, really cool!! The rest of the time we were in the camping place resting a bit, drinking caipirinhas with our new polish friends and organizing the next trip. We start the route to the Iguazu waterfalls together with the unimog family. The first day we made like 350km and we stop to sleep in a petrol station in Coritibanos. Was better than our first night probably because we were not alone… Next day we made only 250km and we stop in Abelardo Luz, an agriculture town surrounded by fields of corn and “yerba mate”, where we were the most interesting thing they have seen in years! J We walk through the national park where there is a waterfall and we could take a bath in one of the natural swimming pools. Next day we made 200 km and stop close to the border with Argentina. The exhaust gas of the vehicles was extremely bad probably because of the bad quality of the petrol, and the suspension of cactus was horrible! It has to be fix. We look for a mechanical and we decide to fix it next day. So we lost one day but it was one necessary day, we fix the suspension and we cross the border (like 3 hours waiting because they had computer problems…).